Hypophosphatemia is defined as serum [Pi] < 2.5 mg/dL. 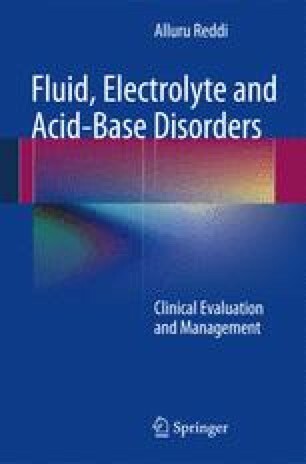 Patients receiving mannitol develop pseudohypophosphatemia, which is caused by the binding of mannitol to the molybdate used to determine the serum [Pi]. Hypophosphatemia can be severe (serum [Pi] < 1.0 mg/dL), moderate (serum [Pi] 1.0–1.9 mg/dL), or mild (serum [Pi] 2.0–2.5 mg/dL). Severe hypophosphatemia can occur in patients with prolonged use of antacids, such as aluminum hydroxide, magnesium hydroxide, or calcium carbonate or acetate. Moderate hypophosphatemia may be symptomatic or asymptomatic. Hypophosphatemia is rather uncommon in the general population. However, the incidence of hypophosphatemia in hospitalized patients with sepsis, chronic alcoholism, and chronic obstructive pulmonary disease (COPD) is high. Patients with trauma also have high incidence of hypophosphatemia. The causes are varied, but can be conveniently grouped under four categories.